One solution for all your print, cut and design needs. EximiousSoft Business Card Designer Pro is a great vector graphics design program with full featured tools for creating professional looking business cards. This application comes with 400+high quality business card templates, 5000+ pre-designed shapes and 500+ attractive clip-arts. You can use from the supplied material to start the layout of your card. The process of designing is based on inserting ready for use elements accessible in the program such as figures, images and the background, and freely shifting them on the prepared project. This Business Card Program lets create great business cards fast, fully customize them using a rich assortment of design tools. You can use pencil tool to draw freehand with simple paths, pen tool to create Bezier curves and straight lines. It provides a dozen shape creating tools create rectangles (may have rounded corners), ellipses (includes circles, arcs, segments), stars/polygons (can be rounded and/or randomized), spirals etc. The text tool is a highlight in the application. You can create or edit single even multi lines texts on full canvas via WYSIWYG environment. You can put a text on a path or in a shape while keep editing. The program has the most powerful vector tools for editing graphics. The text objects, shapes including strokes can be converted to paths easily. To paths, they can be edited by Node Tool: moving nodes and Bezier handles, node alignment and distribution, etc. All vector objects like shapes, texts, paths can be filled or stroked with solid color, gradient colors, pattern and images. Besides that, more than 50+ pre-designed filters which can be used while working on all above objects. Business Card Designer Pro 400 supports business card paper for ink jet and laser printers, from Avery, APLI, Hisago, Sigel, A-One ,Printec and other manufacturers. You can print them on your own printer or export your design as pdf or jpg files and bring to a professional printshop for printing. 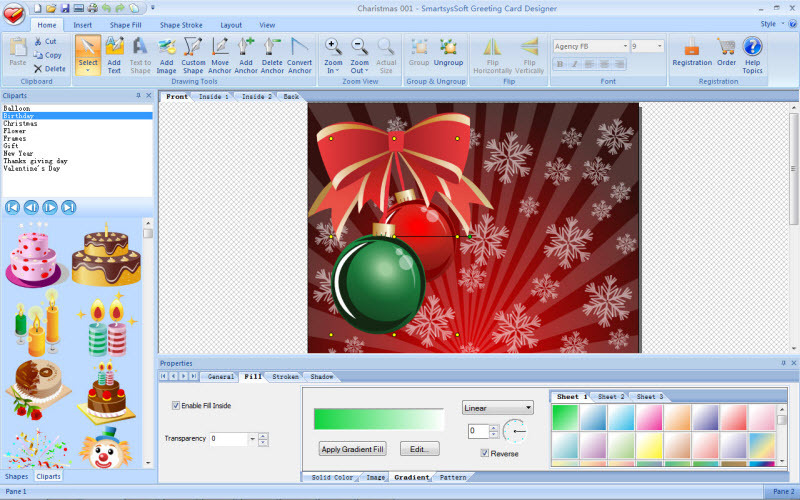 SmartsysSoft Greeting Card Designer helps you easily design cool greeting cards for birthdays, Christmas, New Year, Thanksgiving, Valentine’s Day, anniversaries, or any occasion. It provides hundreds of greeting card templates and a lot of pre-designed symbols, clipart and pictures. So that, you can create an attractive greeting card with easy as following: firstly select a template from templates library to start your design; then add or replace with your own photos or clip art,; finally do some modification for some texts as you requirement. SmartsysSoft Greeting Card Designer is also a great vector graphics program. Some drawing elements such as texts, clip art, shapes, symbols, images can be added to your design as you needs. Each one is painted very smoothly. So that, you can get good-looking greeting cards with very high quality when designs are translated to printing. All vector objects can be filled or stroked with solid color, gradient colors, images or patterns. More than hundreds of dash styles are supported to be used for stroking shapes. Besides that, SmartsysSoft Greeting Card Designer provides very powerful shapes tools to edit path of vector objects. With which, you can create the most unique shapes, symbols or texts if you desires. SmartsysSoft Greeting Card Designer is also professional quality printing software. It supports to print your cards on any Windows compatible printers directly. Also it is allowed to save your design as a high quality image with BMP, JPEG, GIF, PNG, TIFF format for outside quality printing. EximiousSoft Logo Designer Pro helps you to create professional while almost any type of website graphics or business graphics for high resolution printing. It is bundled with over 540+ supreme quality logo templates and 2000+ vector graphics symbols gives you inspiration for logo design. You can easily modify templates by changing texts, colors and shapes or applying filters and effects.You do not need to have any prior expertise in designing for using logo design software.While get an appealing and professional logo in minutes! EximiousSoft Logo Designer Pro is also a great vector graphics editor program. It offers a full set of expert vector drawing tools for painting freely with your maximized design talent. It include to create versatile shapes like rectangles, arcs, polygons and stars, use pen tool to draw bezier paths and supports freehand drawing with pencil tool. Multi-line texts are enabled and can be edited in WYSIWYG interface. And more, texts could be put on any paths which maybe adds more diversity to logo design choices. These objects maybe filled with solid colors, pattern, radial or linear color gradients and their borders may be stroked, both with adjustable transparency. Created shapes can be further manipulated with transformations, such as moving, rotating, scaling, and skewing. Exclusive Node tools give you the ability for editing single or multiple paths and or their associated nodes. By which, you can create a unique logo for business or personal use. EximiousSoft Logo Designer Pro can import and export various file formats, include SVG, AI, EPS, PDF, PS, JPG, BMP, PNG, TIFF. Output logos to different formats is effective but without any quality loss. EximiousSoft Logo Designer is the most powerful and easy to use software for logo maker, logo creation. With which, you can create any type graphics for your websites. It can also be used to customize high quality professional-looking business graphics such as such as business cards, letterheads, posters and other business stationery etc… EximiousSoft Logo Designer provides 50+ pre- designed templates. Just choose a logo layout you like from the collection of pre-build templates, edit the elements of the logo, then add your business name and slogan. And finally, apply some styling. That is your own impressive logo. You can create any shape graphics as you desired with powerful drawing tools. Move, delete or add even convert anchors for a shape with simple clicks or drag. That’s really simple. EximioussSoft Logo Designer supports export your logos to JPG, GIF, PNG, BMP, PCX, TGA, TIFF files (For JPG or GIF file, the background of images can be set to be transparent). Also supports to print logo from your own printer with high resolution. This program works like a great image editor program that supports strongly layer-editing. With the layers feature you can control the position of various objects in your logo. Any shape or text can be filled or stroken with solid color, gradient style or images high smoothly. And more, the vector objects can be stroken with more pre-designed dash styles. Each one is allowed to include an alpha channel and can be filled or stroken with different transparency. Anyone, regardless of creative ability, can blend shapes and text into an impressive logo in a few clicks. EximiousSoft Logo Designer includes more than 2000+ high-quality shapes, signs, symbols, graphics etc… You can apply a wide range of special or built gradients and other effects for which. The program is intuitive enough to figure out what it does without the need to read user manual. Making a great logo becomes really easy with it. 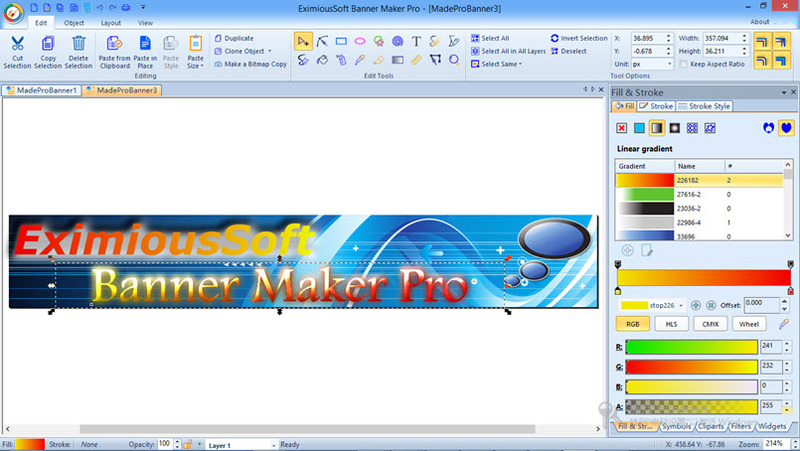 EximiousSoft Banner Maker Pro is a great graphics editing program. It can help you to easily and quickly create absolutely stunning business banner ads for printing with any high resolution. The second goal it also supports to make more attractive web-based banner ads, facebook banners, web buttons, web headers, unique logos, image ads and other web graphics. It is a full featured graphics program and fast way to build high quality banner images. The application offers 400+ ready-made professional templates,You will find a wide range of professional looking designed banners by different industry categories and industry-standard sizes. The program also provides 500+ pre-designed cliparts & 5000+ vector symbols and 50+ nice filters. This will greatly help you to start the process of banner creation. All of them means that for you there is no easier way to create amazing image ads. All templates, cliparts, symbols are pre-designed by EximiousSoft team self. Which are constructed strictly by vector format. So you can scale them to any banner of any size but without loss of quality. All of them also can be edited as you needed. You can retain some drawing elements according to your own ideas, but get rid of other. The program provides a WYSIWYG interface for manipulation of vector images, allowing you to express yourself freely. It offers creation of basic shapes (such as ellipses, rectangles, stars, polygons, and spirals) as well as the ability to transform and manipulate these basic shapes by rotation, stretching, and skewing. It also allows users to manipulate objects precisely by adjusting node points and curves. Advanced designers find these functions indispensable in drawing software to freely create what they imagine. In addition, It allows one to insert text and bitmaps (such as PNG) into an image, as well as perform visual editing functions on them. The last, It supports to import from or export to SVG/SVGZ/AI/PDF/WMF/EMF/EPS/PNG etc. file formats. Convert all popular video formats to Apple iPhone playable video. It can convert from XVid, DivX, FLV, MPEG-1, MPEG-2, MPEG-4, WMV, AVI, RM, RMVB, MOV, and more other formats. to Adobe Flash FLV format for playing by websites or software that supports Flash FLV formats. What can dvdXsoft FLV Video Converter do for you? Do you want to play your video on websites? Do you want to upload your Movie to YouTube? Download and use this software. dvdXsoft FLV Video Converter is a video/movie convert tool to convert video/movie to Adobe FLV video by the two formats supported: FLV(GVC) and FLV(vp6). It can convert almost all video format, e.g.FLV, DivX, XviD, MOV, RM, RMVB,dvr-ms, MPEG, WMV, AVI to FLV Movie / FLV Video format on the web. It support easy-to-use interface, fatstest converting speed with excellent output Video and Audio quality. Now only with quick 1-2-3 steps you can share your favority movies on FLV on the web or local anytime and freely. Why choose dvdXsoft FLV Video Converter? We optimize output Video for FLV, so use our dvdXsoft FLV Video Converter you will get more fixed video for FLV watching. With our own developed Synchronize technology, the software will not have any unsynchronizing problems on output FLV Video. 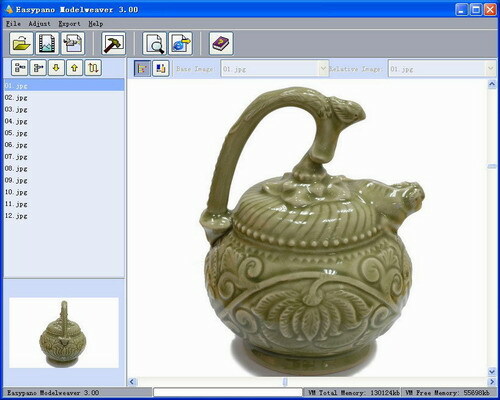 BMP Picture Maker is an useful software to convert many picture formats to BMP format. It supports JPG, GIF, PNG, TIF(TIFF), ICO, EXIF, WMF, BMP, EMF format etc. It resizes the original picture’s width or height, and has a convenient proportional calculator to keep aspect ratio easily. It outputs the different pixel format RGB24, RGB32, RGB64 or indexed 2, 16, 256 color. It can rotate or flip bitmap. You can add text watermark which can be placed into any position of the picture. It also converts a frame of animated picture to a bmp file. December 14, 2014 Illustration, Multimedia & Design, SoftwareEasypano Holdings Inc.
Modelweaver 3.00 is an easy-to-use, and powerful 3D object VR movie creating program, which can help the user to create high quality 3D, interactive VR object movies quickly. It can be used in the fields of products, garments, collections, arts and crafts, antiques and other objects they want to display vividly on the Internet or CD.